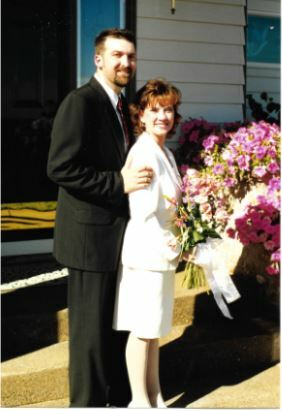 Twenty years ago today Dianne and I exchanged vows. We both said "I DO". We both affirmed in front of God and everyone all the things we would do...in sickness and in health. Implied are all the things we would no longer do. Done right, marriage is tough. If it was easy there'd be no divorce. It's work. Sure, there are couples out there that make it look easy. Jack Nicklaus made hitting a golf ball look easy...doesn't make it so. Two hundred and forty months. One reason marriage is not easy is because it's contrary to human nature. Normal human instinct is to self-preserve, but the covenant of marriage requires putting another ahead of yourself...each day...every day. There's no time or place for self-preservation. There's only your partner and their well-being. So many moments come to mind. It's her crying on my shoulder when the day's been too strong. It's laughing together to the point where we can't even remember what we were laughing about. It's hoping and praying that twenty years represents only the beginning of this crazy experiment. It's knowing no limits. One-hundred seventy-five thousand two hundred hours......and happily counting. Congratulations!! Thanks for the nice post and reminder that we all have lives outside of the office that don't rely on our work experience.